First of all, 2008 was an exciting year for East Asia. Since Summer Olympics would take place in China, many tourists were coming to explore the region. 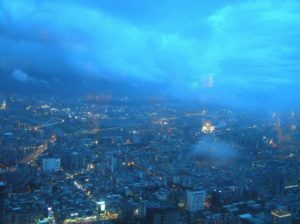 While China was exciting to explore, Taipei allured with the promise of the tallest building in the world. 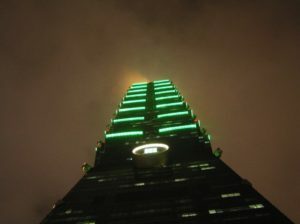 Taipei 101 held the title, until 2010, when The Burj Khalifa took it over. I didn’t visit Taipei just for the building, but I was excited to see it. It represented a victory of human thought over fear and limits, and I wanted to see it with my own eyes. As much as I liked what I saw, it wasn’t the best of what Taipei had to offer. The elevator of the skyscraper’s another story, though! It went from one of the lowest floors to the highest one in less than a minute! I really wish we had elevators like this everywhere. There’s something calming in Buddhist temples. Somehow when you visit them, you can reconnect with something bigger than yourself. It’s crazy how such traditional places can be neighbors to big skyscrapers, scratching the edge of tomorrow. Still, as I said before, everything was blended together perfectly. It didn’t feel unnatural or forced: it was just the past, present and future together in a perfect harmony. After dynamic sightseeing all we needed was a bit of calmness. This is exactly what Buddhist temples offer. We were happy to enjoy some peace before heading farther on. All in all, there are many places like this in Taipei. Wherever you go, a temple is probably at stone’s throw. It’s a little paradise hidden among the concrete jungle of skyscraper and the constant noise of life going on and on. 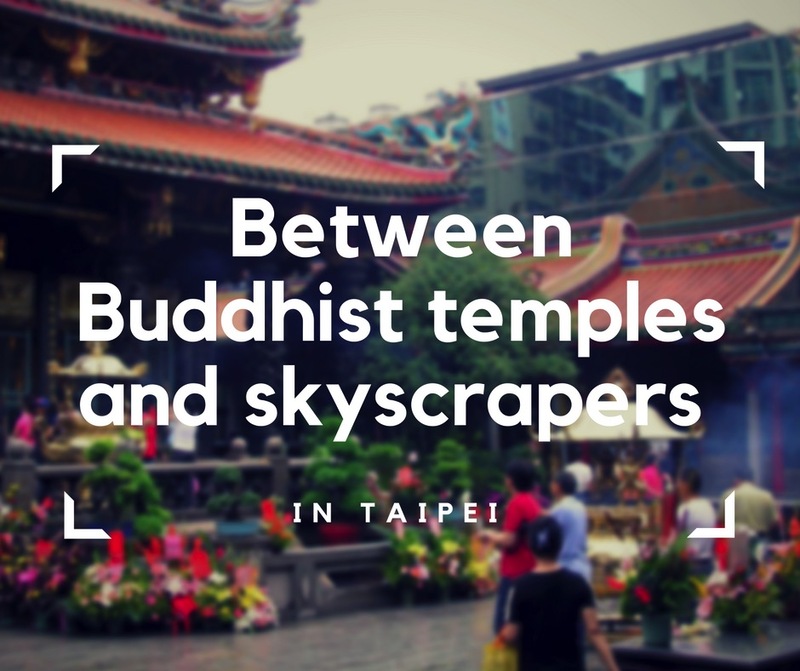 Technically, I could include green gardens of Buddhist temples above, but there were so peaceful and beautiful on their own that they deserve a separate subheading. 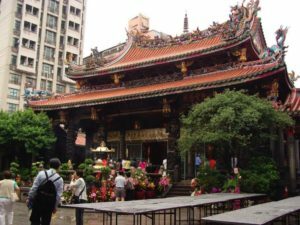 Again, there are like jewels of Taipei – a fresh breath in a cosmopolitan, busy city. I have nothing but great memories from there, and their serenity still makes me smile. 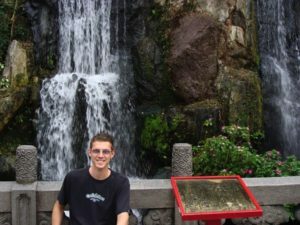 Waterfalls and colorful gardens full of flowers are just another faces of Taipei. Perfect if you want to relax a little bit. Chiang Kai-shek Memorial Hall is a monument built in a memory of Chiang Kai-shek, former President of the Republic of China. It is very important to local history, and the building itself looks very nice – not only on photos! I remember reading that the shape of the roof is connected to number eight. Traditionally it’s a number associated with good fortune. I might have seen more beautiful architecture in Asia, but I appreciated the depth of emotions connected to the place. Definitely, a good place to visit if you want to get a taste of Taiwanese history! As much as concrete jungles may not seem too appealing by day, they bloom at night. I loved how Taipei lit up at night. I could just step back and watch the play of city lights in awe. These are moments, moments that catch you in awe when you don’t expect it, that are really stuck in my mind. It felt wonderful to observe a journey to future, glowing in front of my eyes. It may not be unique to Taipei, but I recommend you to watch cities by night. Their charm doubles then. 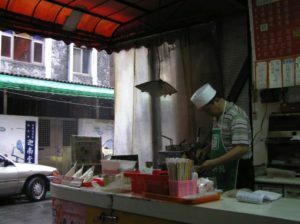 I might have had just bad luck, but I really didn’t like street food in Taipei. Normally, trying street food is one of the most exciting things when I travel, but I was terribly disappointed with Taiwanese cuisine. Other Asian cities I’ve visited (Shanghai, Hongkong, Macau) can take pride in the better street food. At least in my opinion. As they say: there’s no accounting for taste, so you may actually like it. On the bright side: at least it was memorable! 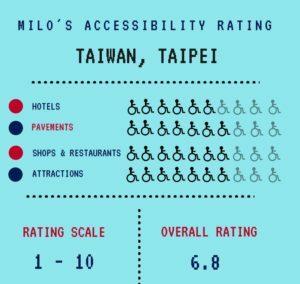 Sadly, hotels in Taipei weren’t top-notch, when it comes to their accessibility. There were not exceptionally bad, but I can call them average or generally okay at best. Finding an accessible hotel wasn’t super easy back in 2008. I hope things have got better since then. Again, pavements are average, or a bit better than average. 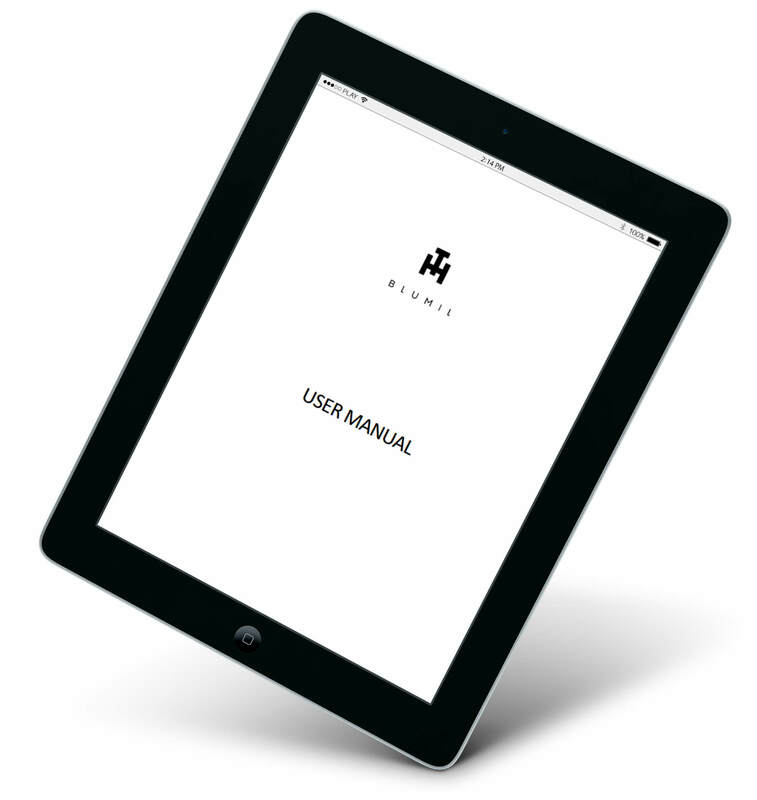 There are not too many holes and navigating isn’t too dangerous, but they could be way more accessible. Still, the situation’s pretty good. Not every single shop or restaurant is accessible, but most of them are. Generally, there are very often ramps waiting for you, or flat entrances. Accessibility is not a problem here. 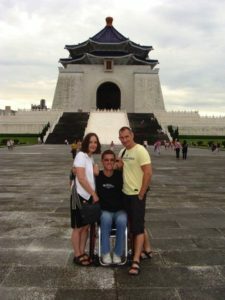 Buddhist temples or museums may have stairs, but most of them are adjusted to needs of wheelchair users. There’s always an elevator, even if the building seems to be too ancient to have one. In general, you might not be able to access every single attraction Taipei offers, but you will be able to enjoy a majority of them. When I look back and dive into my memories, Taipei always goes under the label: “great time”. It might have been raining all the time when I was there, but that’s okay. I didn’t go there to be gloomy, so I rebelled against the weather and had a wonderful time. I have no doubts that since my last visit, the city’s been racing in the direction of the future even faster. Certainly, Taipei has its own flavour – a one worth trying.